Since the Subud World Congress in Freiburg, much has been happening with th e Atalanta project. We would like to share what we are up to in addition to the use of our $3500 grant money received from the SESI $100,000 Project Fund. 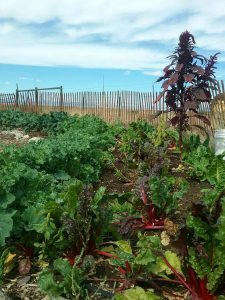 Summer 2018 proved to be another successful growing season for the cooperative orchard garden, providing 17 families with fresh produce and surplus going to the local food bank. Atalanta is in the middle of their second annual SeedMoney fundraiser. Last year over $2000 dollars was raised which helped purchase table height garden beds, orchard trees and upgrade the solar system and water delivery systems. Funds from this years campaign will be used to improve paths and the footing under the raised accessible garden beds for a solid, firm, level surface for gardeners of all abilities. We had two wonderful educational interactions with Colorado College faculty and students with the theme of environment and spirituality. Students were hosted by various spiritual groups and then they and their hosts had a sharing and discussion presentation and luncheon. Each session was very special and rewarding. Atalanta provided equine therapy over a weekend in August to survivors of a mass shooting. It was a moving, uplifting experience. We will continue to work with therapists and groups to provide this service.